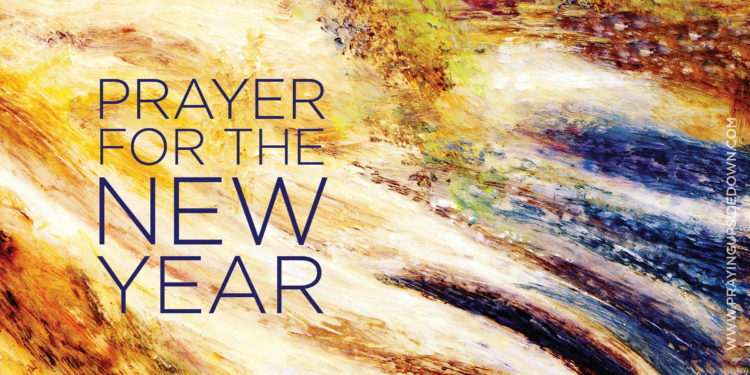 READ ON TO GET YOUR FREE FEBRUARY PRAYER PROMPT CALENDAR DOWNLOAD! February is arriving at the perfect time—we all need a little more love in our lives. Maybe you’ve been disillusioned by the meanness on Facebook lately, or disappointed when people in your lives seem to be showing their true colors (and they’re not very pretty). Maybe you keep hearing about hate and want to be intentional about choosing love. Perhaps you’ve even wondered how on earth we’ll ever convince another person to want to embrace Christianity when the image put out there by so many doesn’t look like the Christ we’re proclaiming. I hear ya. Unfortunately, I’m right there with you. And now it’s nearly Valentine’s Day. Normally I groan a little on the inside at that. I have a wonderful husband but this holiday has always felt like one geared more towards infatuation than permanence, so it hasn’t meant a lot to me (and as a redhead, I’ve never been a big fan of red or pink). But LOVE? Now that is something I can celebrate. And so it’s an easy step to turn this holiday into one that’s not about two people—but about our True Soul Mate. It’s about God, who taught us about love, practiced love, advocated love, and IS love. Because one thing I believe is that love is always the answer. I’d rather err on the side of love—give too much rather than not enough. Welcome everyone in and let God change their hearts, not me. The other thing is that people do watch us to see how we treat people and whether we live what we preach. Jesus said, “Your love for one another will prove to the world that you are my disciples” (John 13:37 NLT). And that’s what I want to do: Love people so completely, so well, so unswervingly that no one can question whether I love God—because that will be abundantly clear. So I put together a prayer prompt calendar for this month that is all about love—about feeling compassion, stretching those boundaries, and loving even when it’s difficult or uncomfortable. Normally, these monthly calendars are available only to my newsletter subscribers, but in the spirit of (you guessed it!) love, I am offering this to all of you. 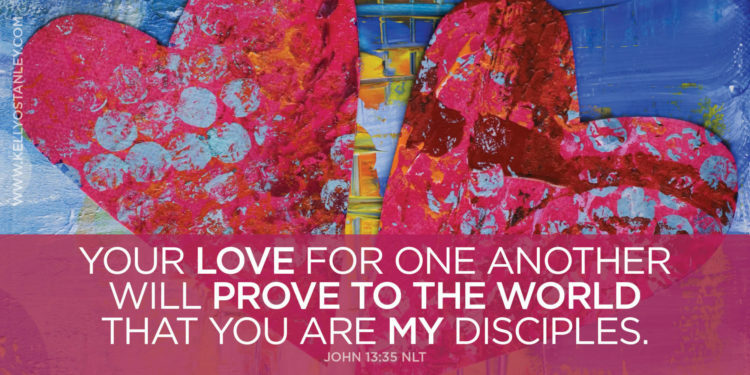 Print it out, tuck it in your Bible or on your fridge, tape it into your prayer journal, tack it on the wall by your mirror, or distribute copies to your church—whatever you can do to remind yourself to practice love. Click here or on the image above to go to the high-res PDF file. At the top of that page, click the disk icon to save or the printer icon to print. If you enjoy this, check back next month (or subscribe to my newsletter while you’re here) and you’ll get them every month. But if not, that’s okay, too. I just want to share this one with all of you right now. Pray with me, and then enjoy this song :-). Dear Lord, when people look at me, I don’t want them to see division or strife or discord. I don’t want them to feel judgment or exclusion or hate. I want them to see You. To feel the kind of love—the power of it, the mercy and kindness and generosity and stability and permanence—that can only come from You. Open my mind and soften my heart so that I can love like You do. And help me to love You more freely, openly, and passionately, because Your Love remains forever. Amen. I’m afraid to listen/watch/read the response to what happened in Orlando, because I don’t want to hear this one tiny word. And I am terrified that if I look, I’ll find it. Oh, Lord, we are desperate for you today. We’re quick to be outraged—and I believe most of us genuinely feel the pain of such a wrenching and tragic loss. But how long will it last before we move on? I don’t know what to do with my feelings, with this horror and sorrow. I don’t know where to go. Prayer seems woefully inadequate. Debating gun control and Islamic extremism and homosexuality seems to be the likely outpouring after violence of this magnitude. But then what? What have we solved? All we will have done is to separate again on the dividing lines of a political issue. When are we (as a culture, as society, as a religion, as a human race) going to change? To be spurred to radically change an environment in which hatred reigns? When will we discover ways to act in love? To do as Jesus prayed we would—to help the world believe all that He said is true, that He is who He claimed to be—and as a result, that everyone will believe. 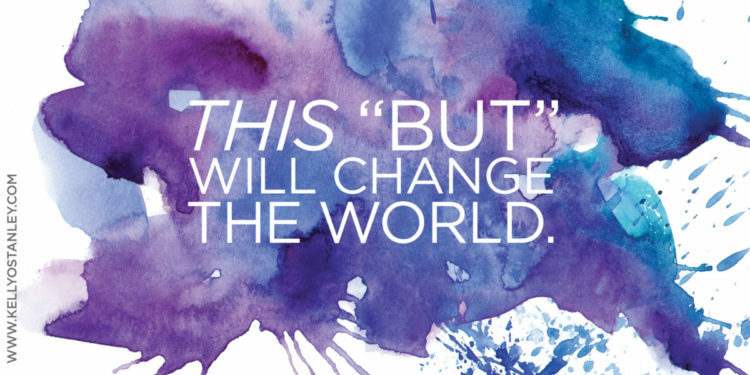 That the world will find hope and will be able to seek true change. When we will understand that there is no “but” in your promise to love us, to adore and reach out to each of us, no matter what terms we use to define or identify ourselves? And when will we stop using the word “but” to justify not acting? Not loving? Not welcoming and nurturing and accepting? You are not a God of exclusion but one of inclusion. Because of that, I have a place to rest when I’m overwhelmed with grief. I can lean in to you, sheltered by Your grace and comforted by Your mercy. Even me. The one who has accepted your generous and stupendous offer of love—even though I didn’t (and can’t) earn it. I fail regularly—but You love me anyway. I sin. Lie. Fail to act. Miss opportunities. Find excuses not to serve you. Forget to pray when things are good. I’m the one who gets self-righteously angry at those who judge—but finds herself judging just as harshly. And at last we get to the only but that matters, the one that trumps everything else. But You love me anyway. Without exclusion. Period. And You love Edward Sotomayor Jr. And Stanley Almodovar III. Luis Omar Ocasio-Capo. Juan Ramon Guerrero and Eric Ivan Ortiz-Rivera and Peter O. Gonzalez-Cruz. And the others who are nothing more than random combinations of consonants and vowels to most of us—until we look online at the photos and read the descriptions of each of the victims. Until we look at the eyes smiling out of the computer screen and understand that these are real people, real souls, real lives ended out of hate. That this is senseless and tragic and that real people are facing the very real absence of people they love. But You are bigger than our excuses and greater than our failures and near to us in our pain. And as offensive as it feels to me to acknowledge this, I know you feel love, too, for the shooter. Your particular type of love is one that is so far beyond us that I fear we’ll never be able to grasp it. But please, Lord, let us try to understand. Your love is all-consuming, enveloping, without limit or exclusion. No buts at all. Whether it’s true or not, I can’t help but feel like we’ve all failed, somehow—horrendously and irredeemably. We are all part of this culture, this atmosphere of division and exclusion, whether we actively contribute to the hatred or not. Forgive us, Lord. Comfort us, Lord. Give us hope and inspire us to find ways to keep this from happening again. It certainly feels like a losing battle, but Your Word tells me You have overcome the world. That You have victory over all evil and hatred and pain. So I hold on to that today, even if the promises seem impossible. Even if the news feeds seem to broadcast a different story. I hold on to You. I’m heartbroken and helpless and I feel lost. But You are right here. You whisper words of comfort and wrap Your arms around the mourners. You are not rejoicing but, instead, feeling the collective pain of this world that is broken and troubled and misguided and hurting. Sweet, sweet Lord, forgive us. Hold us. And never, never stop loving us or teaching us how to bestow such a tender, valuable gift on every single person in our lives. Amen. Oh, Lord, You are so beautiful. You are the Lord of Light. The Giver of Life. The Lover of my soul. The Hope of all generations. And yet we are living in a day that seems dark. Bleak and without redemption. We see hatred spewed online and in newscasts. Distrust in the unknown and unfamiliar. We’re noticing the ugly, the divisive, the discouraging and demeaning. We’re not looking in the right direction. We’ve forgotten that You are in everything. That You can be found everywhere. That there is nowhere we can go to escape You. We cannot do anything too bad to be denied Your presence. I know this. I do. And still I find myself retreating, harboring distrust, feeling uneasy. The world is scary. There is so much hurt. Anger and pain. But You, Lord, are good. No matter how much bad I see, that does not detract from Your goodness. You feel the sorrow and despair. Know it. Redeem it. And ease the pain of it. You will never let go. You are supremely able. Completely in control. Utterly trustworthy. Thoroughly loving. There is nothing that we will ever experience alone. Lord, I don’t know what to do about all the hurt and hatred. I don’t know how to break addictions, heal divisions, restore relationships, bring peace, provide homes, or retrieve the lost. All I can do is counter it with love. And since You are the very definition of love, help me to lean on You when I feel too weak to stand alone. When I hunger for fairness, peace, or kindness, feed my parched soul with Your Word and nurture my faith with Your presence. Let me wholeheartedly believe that the world has not spun out of Your reach but that You are perfectly aware, perfectly able, and working towards something ultimately better than anything I can imagine now. When I doubt, assure me that You know more than I do. When I can’t see beauty, remind me that You see farther, hope deeper, love better. Let me see You, Lord. Let us all see You. Let us remember who You are, and let us go into this year surrounded by Your beauty. Revived by Your strength. Renewed by Your hope. Exultant in possibility. Emboldened by Your truth. 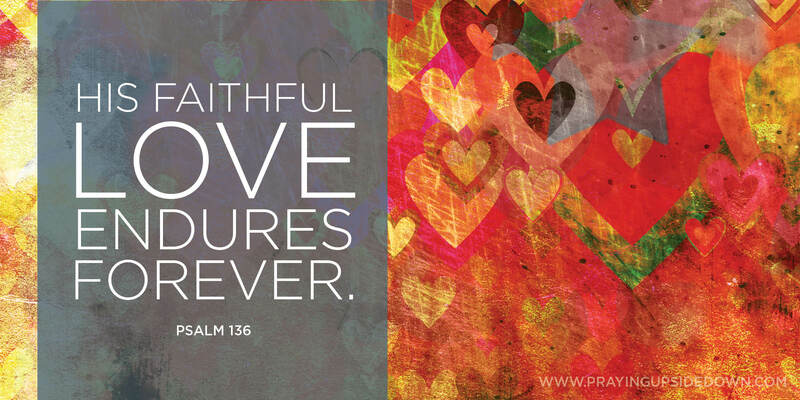 Rejoicing in Certainty that You love us and will never leave us. Because You are God. And somehow, miraculously, defying all logic, You love us. And You are with us. And that makes this new year one to celebrate. No matter what. And this is why I am thankful today. Give thanks to the Lord, for he is good! Give thanks to the God of gods. Give thanks to the Lord of lords. Give thanks to him who alone does mighty miracles. Give thanks to him who made the heavens so skillfully. Give thanks to him who placed the earth among the waters. and the moon and stars to rule the night. He remembered us in our weakness. He saved us from our enemies. He gives food to every living thing. Give thanks to the God of heaven. Bekah Pogue got my attention when she wrote such a wonderful review of Praying Upside Down (always a good way to get me to notice you!). 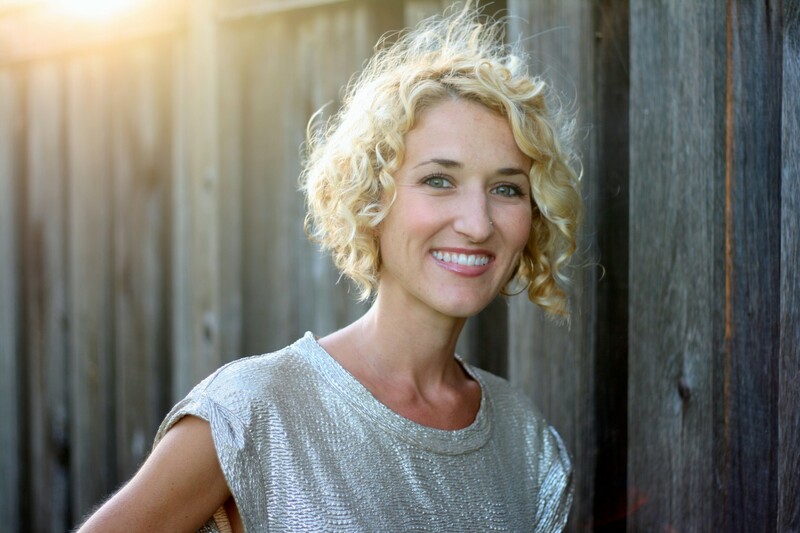 I started reading her blog Upcycled Jane: Embracing Beauty in the Everyday, and found this post. When I stopped crying, I asked for permission to share this one here. It’s the sixth and final essay in a series about the final week of her dad’s life. She said, “Loss served as the the catalyst to my faith, and it is through this story, I see God’s invitation to experience Him as the greatest story.” Enjoy! I’m finding grief to be not like the stereotypical dark, hovering cloud, but more like a portion of my heart has been removed, not to grow back or forget its original whole, forever changing my journey with a new heartbeat, a changed rhythm. My heart beats heavy as I write. Conjuring up dad’s last day on earth is an unexplainable tug of sorrow and peace. It’s one I have to share, can’t help but process; it’s the day that will impact today, tomorrow, and every day after. The afternoon of April 2nd, behind-the-scene momentum built after receiving the doctor’s shocking words that Dad would have to be discharged from the hospital. A shared skilled nursing facility room, or going home on hospice were our options. We made calls. We checked facility availability. It’s not unlike calling for hotel reservations, but with the realization that once you check in, you don’t check out. My years as a hospice intake coordinator came flooding back; talking with grieving families, helping them understand end-of-life-care. And here I was, on the other side, shaking my head at the horrible irony. We didn’t want Dad sharing a room with two other people, left to die in a foreign place. But we couldn’t bear the thought of watching him take his final breaths, lying in a hospital bed in the living room, near the piano. It was a lose-lose situation, and in the end, hospice at home was decided for the next day. Before leaving, I found dad’s ear: Dad, please, go be with Jesus tonight. I don’t want mom to have to remember you passing away at home. I don’t want her to walk down the stairs every morning and re-live finding you there. Please, go be with Jesus. As much as I want you here, God would you please call him home tonight? Leaving room 575, my dad’s breathing was regular, his deep coma almost a joke, as if he’d been taking a 5-day nap. We exchanged hugs with Michele, a dear family friend and former ER nurse, as she was planning to sit with Dad for a bit. Ten minutes after arriving back at mom’s we received the call. God had called Dad home. He’d heard our cry. Dad was in glory. God’s timing perfect. There are moments I’ll always remember: looking at my husband when the pastor pronounced us “husband and wife,” the elation at seeing our first positive pregnancy test, the joy at seeing it again two years later. And now this news; the reality that my dad was gone. It was a thousand emotions in the same heartbeat: relief, sadness, confusion, numbness, but blanketing them all was peace. An uncanny, undeniable peace. It was finished. Dad was no longer trapped in a cancer-infested body. He was now in eternity. During the next few hours, time sat still. Every action became deliberate, every sense heightened. We bathed the boys, the water feeling neither hot nor cold, but wet. Food tasted like sandpaper, and moving took every ounce of energy. To bed- first Ty, then Tanner. Snuggled under dinosaur sheets in the bed he slept in when staying at Mimi and Papa’s, I cupped his face. Papa went to be with Jesus tonight, T. He got a new body, and they are having a huge celebration for him in heaven right now. My words came but tears lacked. We laid there, Tanner holding his Mario stuffed animal, his body wrapped in my arms. He was quiet for some time, and then spoke. What about his glasses? Does he need them in heaven? I smiled, touched by his child-wonder, a concrete question. No buddy, he doesn’t. In heaven, he can see without glasses. He gets a new body; one that’s healthy and free of sickness. Simple faith, pure questions, that may be my new prayer. God, help me have child-like faith. We met back at the hospital, our final visit to room 575, a building that had become our temporary home for the past week. I shut the door behind and approached my father. How different he looked in the hours since he’d passed. I’d seen death before- when working for hospice, and with my grandpa the day before he died. I’ve heard people talk about this peace but somehow thought it was a played up, spiritual emotion to make people feel better. Bending near, holding his cold hand, I can attest to the peace. A peace that surpasses all understanding. Staring at dad’s face, I couldn’t help but smile in the pain, feel joy in my greatest sorrow. I was looking at someone who was standing in the presence of God. Such a surreal and shadowy experience- like peering from behind the stage at a soloist’s dress rehearsal, seeing the lights, but not feeling their warmth as they do on their face. That’s the image I had of dad in that moment: warm light on his face, seeing His Savior, experiencing complete healing, then looking behind his Heavenly Father and seeing a familiar figure- his earthly father! Oh the hugs, and pats on the backs, and cheeseburgers that were enjoyed in heaven that evening. And herein lies the clencher: this is not the end. Oh no! This, my friends, is the real beginning. The beginning of dad’s journey in Eternity, his journey enjoying Forever with his Maker, and this marks the beginning for each of us affected- his family and friends. As his daughter, this is the beginning of the story God is writing in my life. My story does not end here. I refuse to say that at 64, my dad passed away, and my world fell apart. Sure, it will for a while, really forever. But I refuse to hang my hat on that date. I refuse to say my life ended the dad my dad died. 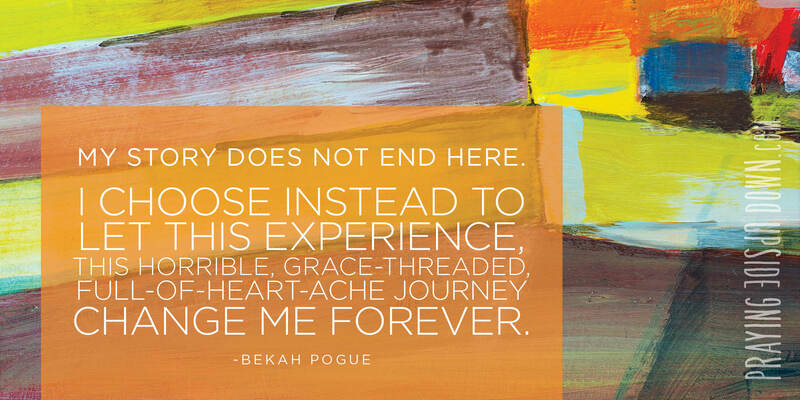 I choose instead to let this experience, this horrible, grace-threaded, full-of-heart-ache journey change me forever. Like Donna said, I will never be the same, and chances are if you’ve walked this with me, or someone dear to your heart, you too will not be the same. Good. Let this crazy grief process begin. Let the sobs and anger and questions and quietness come. But let us not forget that God is doing something beautiful in His time. And His time is every.single.day. As I reflect on that week in the hospital, in the music God brought to mind, the prayers, the texts, the visitors, the clinging of Dad’s arm and the clutching of one another, in the questions and in the answers, one thing stared me head-on. Not once in that week did I think about my schedule. Amazing how I worry about the calendar and to-do lists and the entertaining of dreams and concerns of what if or if only…How quickly in an emergency, do the extras dissipate and priorities come into focus. Friends have asked how losing a parent affects my day-to-day and I say this: the small stuff doesn’t matter. It really doesn’t matter. We are given today, and that in itself is a gift. Busyness or distraction is my tendency and I don’t want to miss a thing. I want to sit in every feeling, taste every tear, be present in every second of this process. God is calling me, as He has for some time now, He is drawing me to the edge and asking me to jump. He is asking if I trust Him to be my everything or if I simply sing about it. It’s the scariest act I’ll ever do. But this is where His peace is made perfect, and I jump into waiting arms- the same arms that hold my dad, that hold all who know Him and have passed from this life to Glory. If I live to be 64 like my dad, that means I have the next half of my life to experience this peace, God’s perfect love, this freedom in letting Jesus reveal His story day-by-day. And each day I’ll whisper, God, don’t let me miss you. Give me ears and eyes, hands, and a heart to see you everywhere. I’m here. You guys are all probably tired of hearing me talk about my book (which, incidentally, releases in just three more days!). So I thought I’d try something dramatically different today… and talk about someone ELSE’s book! I know, I’m way out there. You should be used to my particular brand of crazy by now. But I hope you’ll keep reading anyway. I’ll be honest. I struggled with this for a little bit, long before I gave the book a chance. I want to only give honest reviews, but since I have a book releasing soon (I may have mentioned that once or twice before), I also only wanted to be careful to only put positive words out there. I was afraid I wouldn’t be able to do that. This is not the type of book I normally pick up. I tend to avoid anything that is remotely categorized as self-help, anything written by life coaches or anyone else who might end up being overly enthusiastic. Now that I say this out loud, I’m realizing how badly I actually need this kind of help. A life coach might be rather beneficial. But also, in my defense, I have lots of really good relationships. My family is close. My kids talk to me about things. My husband and I are happy. My business relationships tend to last for many years and end on good terms. And I have lots of really amazing friends. I am blessed. So fortunate. So grateful. But, as it turns out, there’s always more to learn. And sometimes, the way you least expect to find help ends up being the best source. As it also happens, there was some really good advice in this book. 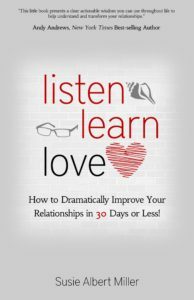 In a nutshell, here’s the idea: We all have relationships that are in need of improvement, and since relationships are the foundation of our lives, working to improve them will improve life in a bunch of different ways. To achieve this result, we just need to follow three basic steps: Listen, learn, and love. Sounds easy, right? Sure. Except for the fact that, while I like to think I’m a pretty good listener, I’ve finally admitted to myself that I probably turn the conversation around to myself way too often. I think that my reason for doing this is because I’ve had a similar experience and want to share it to show that I understand what the other person is feeling. And maybe that’s true. Or maybe I need to be a little more self-aware and take the focus away from myself. That’s how I can be a better listener. Learn? No problem. I love to pay attention to what makes someone tick, to figure out what they love and need and try to provide that. I think I’m pretty good at that. It’s why I love to buy gifts for people—because I like to surprise them by letting them see how well I understand them. But then I read about how learning someone also means allowing them to grow and change. I want others to allow me to evolve, to become something new, refined, better. But it made me wonder how accepting I actually am of other people who are making changes in their lives? OK, maybe I fall short in those areas sometimes. But love? That’s an easy one. Perhaps. But to love well? Not always our first instinct. Because it’s based on the ideas of listening to the people in our relationships and learning them deeply. Loving them well “requires short-term sacrifice for long-term gain” (p.95). Like being a mom. That makes sense to me. But how do I do this in business? In friendships? I guess all of it comes down to one idea. We must be willing to make a conscious choice to shift the focus away from ourselves. Improving relationships is about doing the hard things—denying yourself in order to truly listen, coming out of your own interests and self to learn about others, and sacrificing your preferences, time, and pride in order to help the people in your life feel seen, heard and known. Sounds a lot like the foundations of the faith I try to practice, the ways I want to live. Sounds a lot like the stories I hear of Jesus. Come to think of it, Jesus was all about relationships. He sacrificed everything to make us able to draw close to Him. And just as He wants to know us, we can apply these same ideas to our spiritual lives and relationships, too. Listen to Him. Learn Him. And love Him. How do we do that best? By loving others. 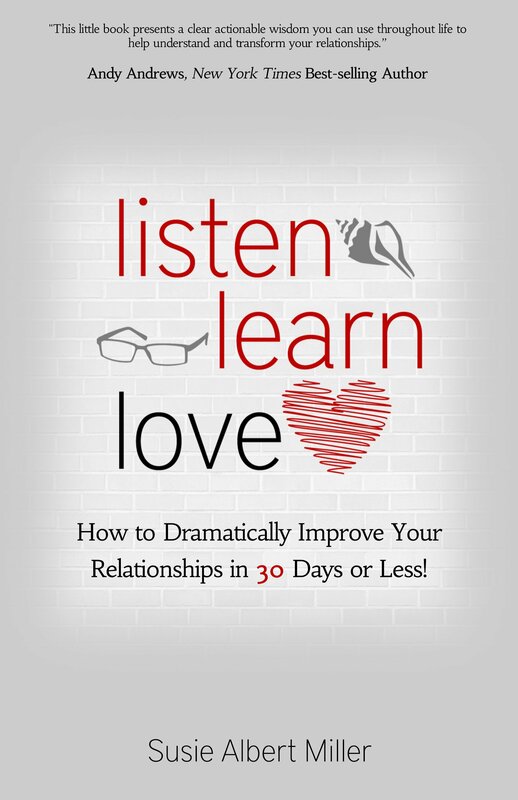 If you want some practical ideas of ways to implement these concepts into your relationships, click here to pre-order Susie Albert Miller’s Listen, Learn, Love. It comes out on May 12. And because I adore getting to know each other better and want to interact with you all as friends, would you take a moment to comment below? Tell me one tip, suggestion or thing that you do to be a better friend. Or tell me about a time someone showed you how much you meant to them in a new or surprising way. I know how I would answer that second one right now: all of the Facebook messages people have posted about my book, the pictures of people holding my book, and the gushing, enthusiastic responses to what I’ve written that have been coming in the past two weeks. I can’t tell you how much it means to me to know people are taking my words to heart. You’re listening to what I had to say. Learning about me. And loving me in the nicest possible way. And the book’s not even fully out yet. You guys are amazing. And see? There, once again, proof that I don’t have this thing down yet: I somehow managed to bring this whole post about being selfless and others-centered right back around to myself. Sigh. I’m sorry. I’m so sorry. My heart is grieving and my soul is overwhelmed with sorrow. How can Your people pass legislation that is so hateful and hurtful? How can such blatant bigotry come from people who claim to know You? Because wherever You are, light shines in the darkness. Wherever you go, lives are changed and people are welcomed. Wrongs are righted. Hope is born or renewed. And You are glorified. But right now, light isn’t shining. The candles in our souls are sputtering, desperate for life-giving oxygen. For a breath of rightness. For the life and light and hope and peace You offer. Make Yourself known. Let us see You. Let us finally grasp what You came to show us. Let us begin to love— freely and without judgment. Let us begin to act with kindness and compassion. This world is upside down in all the wrong ways. You said let the children come. You said ye who is without sin, cast the first stone. You said above all, love. Love the Lord thy God. And love thy neighbor as thyself. You didn’t say let’s disguise our judgment and hatred behind laws. You didn’t say it’s OK to turn someone away who doesn’t believe the way I do. You didn’t say to use our belief in You as a shield to hide behind or a way to set us apart. You walked among the broken, the shunned, the hurt, and the lonely. You reached out Your hand. And You offered love. A fullness of life that can’t be found anywhere else. But try as I might, I cannot see love in this. And it’s breaking my heart. Lord, my soul cries out to You. I reach for You in desperation. Sadness. Despair. I beg for Your forgiveness. I pray for Your guidance. I long for the world to embrace You. And I am so, so very sorry. As published yesterday at the Internet Café… Happy Valentine’s Day, everyone! Throughout my years of searching for God, I’ve seen Him in so many different ways. Kindly grandfather hovering in the heavens… fierce protector… intimate lover… friend who knows me… savior who redeems me… teacher who reprimands me… strict, righteous judge… compassionate forgiver… Different seasons have brought an awareness of different aspects of God. And yet, they’re all God. They’re different facets of this glorious, incomprehensible being that, as Christians, we spend our lives trying to understand. To see. To know. This year I’m starting a new tradition. I’m going to write a love letter to God. Enclose it in an envelope. Label it with the year. Wrap it in a satin ribbon and tuck it away. Every year I’ll add to this and keep my packet of love letters in a safe place. This is why: We like to think we’ll remember the things that matter, but we often forget. I thought I’d remember what it was like to be a newlywed, but as I near my 24th wedding anniversary, the memories are hazy. I thought I’d be able to recall what it felt like when my four-year-old wrapped her arms around my neck. Now she’s 21 and I still adore her hugs but I can’t really call to mind the person she was then… Until I read the words I wrote at that time. Journals, letters, baby books (back when I had time to put them together). 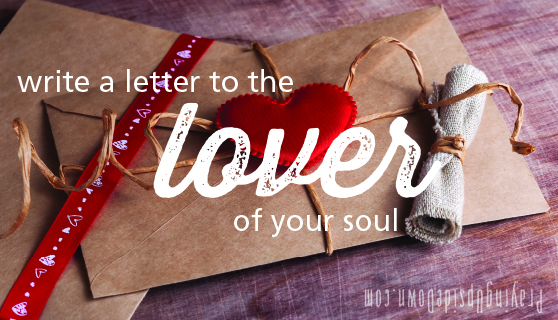 So I’m going to write a letter to the lover of my soul. The One who loves me more than anyone else loves me. Will you join me? Write what you’re feeling. What you know about Him right now. What you wonder, what you need, what you love. What He’s revealed recently. What He is to you, and what you want Him to be. Just pour out your heart to the One who will always listen. And someday, when you’re feeling discouraged, when you’re feeling as though you’ve lost touch with God, forgotten how to pray, neglected Him, forgotten to watch for Him or spend time with Him, pull out your letters. And remind yourself, again and again, all the things He has been to you—the things He still is, because He never changes. Use them to build your faith, renew your passion, strengthen your love. Know that He doesn’t care if the letter is well written or if the handwriting is pretty. It doesn’t matter if you write on elegant, hand-made stationery or the back of an envelope. It doesn’t matter if you write one sentence or three pages. In your heart, determine that this is the gift you have to give to Him. Offer it with pure intention, heartfelt emotion. Don’t feel silly or hold back. Allow yourself to behave as a woman who has found her true love. Because God leans forward in anticipation when you speak to Him. He watches you. He never forgets you. Even if you don’t always feel Him, He never leaves your side. He loves you. He adores you. He delights in you, and He can’t wait to read what you write to Him. Go do it. Right now. Because you are His beloved. You have found the One who loves you deeper and more powerfully than words could ever say. Not just until the candy in the heart-shaped box runs out. But eternally and unconditionally. Forevermore. And He’s waiting to hear what you have to say.